Do you eat protein bars often? I do. Mainly because they are easy and mess-free and get the job done. Okay, okay – most of them also taste really good. Unfortunately, many protein bars contain ingredients you wouldn’t expect to find in a “health” product – artificial colors, flavors, or sugars, to name a few. Wouldn’t it be great to be able to find a protein bar that’s absolutely healthy: sugar free, full of protein, vegan and CHEAP? I know, I know. You say “Kammie, don’t be ridiculous now, we don’t live in a Fantasy World.” Sorry. But what if I could tell you all of these things ARE indeed possible?! Don’t believe me? Have you ever MADE your own protein bars? Too hard, you say? This couldn’t be farther from the truth. 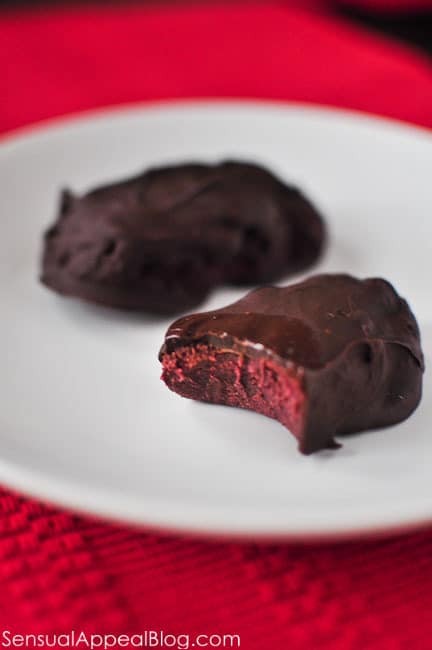 With these amazingly delicious and healthy Red Velvet Protein Bars, you will fall in love! I wasn’t always a fan of Red Velvet. Back in the day I even wrote a post about the Foods Others Love that I Hate and Red Velvet was on that list. I just couldn’t bear eating something with such a pure red color that is so obviously fake. Well, have no fear – I have eaten plenty red velvet since then, for example the jaw-dropping Red Velvet French Toast on Monday (holy crap, for real). I’m done talking now. 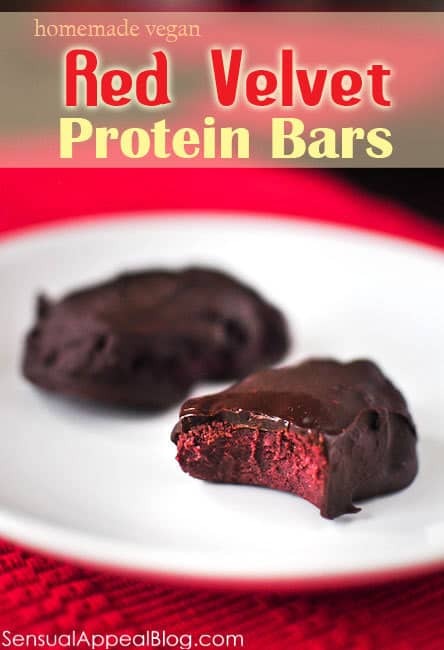 Go make these Protein Bars. You will be surprised how EASY these are! Add the dry ingredients in a bowl and mix. Add almond milk by 1/4 cupful and mix. Add the rest of the milk and vanilla in the bowl and mix still. If the batter is still too liquid-y add the other Tbsp of coconut flour. The batter is supposed to be thick enough to mold into shapes. Take a little bit of the thick batter and shape into balls. Once you’ve formed them into balls, press and mold them into the shape of bars and put on parchment paper. Put the bars in the fridge for a couple of minutes to harden. 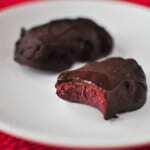 Melt the chocolate chips in a microwave or on the stove and once it’s melted dip the bars into the chocolate to coat. Scoop the rest of the melted chocolate onto the bars with a spoon. Put in the fridge for at least an hour. *I order my Cocoa Cardio from Amazon. It is cheap and gets delivered really fast! Have you made these before? How did they turn out? Have you tried making them with any other type of protein? Leave your answers in the comments below! Thanks Kammie, these look great. 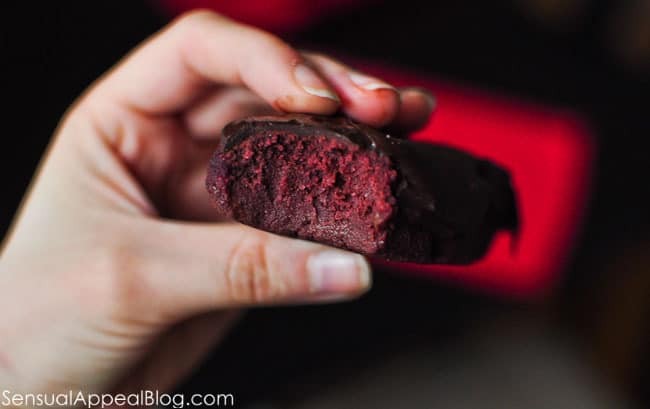 Making your own protein bars at home is easier than many people think and they taste so good! Will definitely be checking out this recipe. polices. These insurance companies of the defendant would definitely bid for an amount lower than the actual value of damages that have resulted. Goodd day! I could have sworn I’ve been to this web site before but after browsing through mmany of the posts I realized it’s new to me.